On an August morning in 1974, a French street performer and tightrope walker named Philippe Petit spent 45 strange and wonderful minutes alone, in the air, at a height of 1,350ft, balancing on a slim steel wire that connected the newly constructed World Trade Centre towers in New York. It was the realization of a long held dream he had nurtured with a passion. 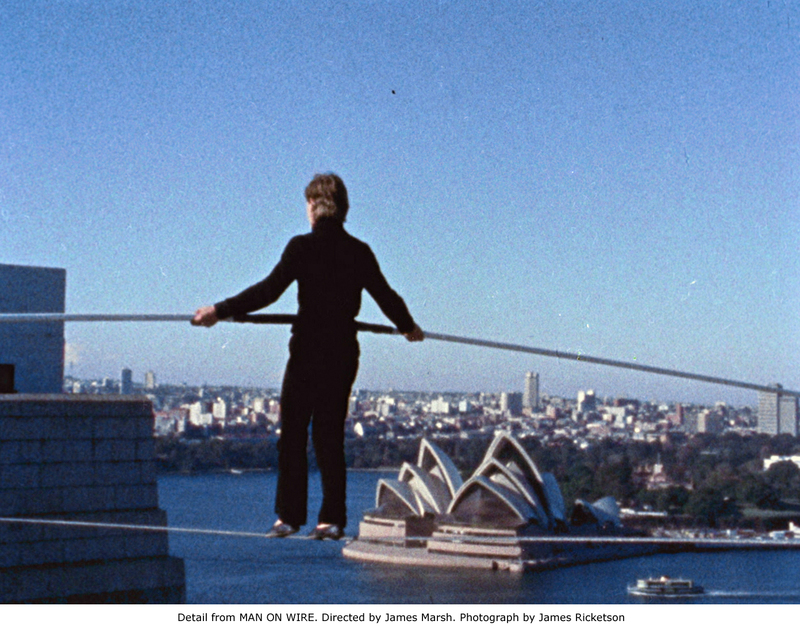 With a raft of awards including an Oscar for Best Documentary feature and five star reviews, Man on Wire has become one of the most successful and exhilarating British documentary features of all time. 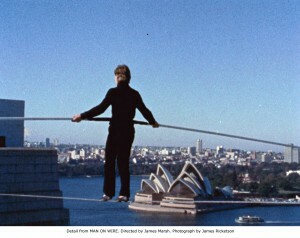 From the ridiculous to the sublime: Man on Wire, directed by James Marsh, must surely count as one of the most beautiful and thrilling documentaries ever made. It retells the story of the legendary walk made in August 1974 by French high-wire artist Philippe Petit across the former Twin Towers of the World Trade Center in Lower Manhattan. That cloud-scraping walk, an act of daring that bears comparison with Icarus’s lunge for immortality, has been called the “artistic crime of the century”. Now, more than 30 years later, and nearly a decade after the site where it took place has become a byword for destruction and horror, its magic and wonder is revealed in all its breathtaking chutzpah. Petit, on whose memoir To Reach the Clouds the film is based, turns out to have been a performance artist almost all his life. He documented his teenage experiments on Super-8, kept many of the sketches and diaries in which he planned future adventures, and by the mid-Seventies had already walked across Notre Dame Cathedral and Sydney Harbour Bridge. Footage of the latter adventure is shown here: soundtracked by Fleetwood Mac’s Albatross, we see Petit, his expression alternating between concentration and rapture, moving below a blue sky that is rendered even more gorgeous by his unquantifiable grace and bravery. But the central story in Man on Wire, told using a mixture of interviews, archival footage and canny, often sensitive reconstructions, is that of the Twin Towers walk. Marsh, best-known for his artfully macabre documentary Wisconsin Death Trip, picks up on Petit and his accomplices referring to their deed as “le coup”, and narrates its conception and execution in the style of a thrilling heist movie. Much of the undercover research that Petit and his boyish friends undertook – taking helicopter flights to make notes about rooftop layouts, faking ID cards – may strike some as scary and upsetting in the light of subsequent events. But I watched the film just a few blocks north of the World Trade Center site, and the audience, when it wasn’t gasping at the gauzy, dream-like nature of some of the stills, was laughing with and revelling in Petit’s piratical brio. Helped immeasurably by his funny, eloquent, theatrical testimony, Man on Wire shows him doing the near impossible: rendering a legendarily vertical city horizontal. He performs a low-tech version of the first moonwalk, a metropolitan version of the ascent of Everest. But he doesn’t so much conquer the Towers as marry them. I’ve watched this film four times and I still can’t believe what he did or what I’m seeing. Each viewing intensifies the galvanising joy and the heartbreakingly unrepeatable nature of his walk. Before the acrobats of Parkour and the gonzo activists of free-running, before the situationist-anarchists of skateboarding in California’s Dogtown, who covertly drained suburban swimming-pools to ride their sky-blue curves, there was Philippe Petit. This was the 24-year-old French highwire artiste who loved to trespass on famous high buildings and ply his marvellous trade, stringing cables between spires and ledges and masts and walking across without a net. On August 7 1974, he achieved his masterpiece: walking across the towers of the World Trade Centre in downtown New York as a stunned crowd gathered below. He and his crew had had to creep up both structures in twin teams, and then attach the wire by literally firing across the initial guiding rope from one tower to the other with a bow and arrow. It was the epat to end all epats : a sensational piece of victimless criminal daring which required enormous cunning and discipline, not merely in the extraordinary act itself – Petit impishly danced back and forth across the wire over and over again while fuming cops raged near the ledge – but in the preparation and the skulduggery involved smuggling in the gear and disguised personnel, as if for a bank job. What Petit brought off was a remarkable, even religious gesture of devotion, both to the building and to New York itself; this was, in fact, a unique act of homage no other artist could have managed, and New Yorkers instantly appreciated it. Graham Greene once playfully endorsed the Great Train Robbers’ crime, but his praise for these violent men was misjudged; I wonder if he missed a trick in not writing about Petit, instead? James Marsh’s documentary about this sublime piece of audacity does full justice to Petit’s vision, using interviews with the man himself and his crew, and using photos from the time, and dramatised reconstructions – there is evidently no home-movie record and no television footage, as this was before the age of rolling coverage and rapid-response news ‘copters. At this point, it has to be said that there is an elephant-in-the-living-room aspect to discussing Petit’s great coup: namely, its similarity in some ways to a very much more malign spectacular brought off at the same location 27 years later. But with shrewdness and elegance, a defiant insistence on the subject’s purity, Marsh tacitly allows us to realise the various parallels but says not a word about them. So neither will I. What of the aftermath? Petit relied heavily on various faintly dodgy and unreliable local American guys to get him into the building, but the actual technicians of the walk were his tried-and-trusted equipe : Jean-Francois Heckel and Jean-Louis Blondeau. There was also his devoted, gentle girlfriend Annie Allix. Their testimony is somehow unbearably moving – they are awestruck and tearful even now, though Petit is just cordial and ebullient. But what is even more painful is the fact that though big-hearted New Yorkers fell in love with the crazy Frenchman Petit, there was no celebrity status accorded to his humble helpers, who wound up being treated slightingly. Petit even betrayed Annie by having a fling with a beautiful American fan. Could it be that though Petit did not fall, there were others who did? What Marsh shows us is Petit’s childlike innocence and almost transcendental faith: faith in himself, faith in his leadership abilities, faith that the escapade would be a success, and faith that he would not fall. His sheer hypnotic self-belief meant that I found it quite impossible to imagine him losing his balance and plunging to his death: he defies gravity. In our world of elf’n'safety, a world where success and fame means working within very well-understood corporate structures, Petit is a rare, exotic beast, and a wonderful one.